This antibody recognizes a protein of 54kDa, which is identified as AMACR, also known as p504S. It is an enzyme that is involved in bile acid biosynthesis and β-oxidation of branched-chain fatty acids. AMACR is essential in lipid metabolism. It is expressed in cells of premalignant high-grade prostatic intraepithelial neoplasia (HGPIN) and prostate adenocarcinoma. The majority of the carcinoma cells show a distinct granular cytoplasmic staining reaction. AMACR is present at low or undetectable levels in glandular epithelial cells of normal prostate and benign prostatic hyperplasia. A spotty granular cytoplasmic staining is seen in a few cells of the benign glands. AMACR is expressed in normal liver (hepatocytes), kidney (tubular epithelial cells) and gall bladder (epithelial cells). Expression has also been found in lung (bronchial epithelial cells) and colon (colonic surface epithelium). 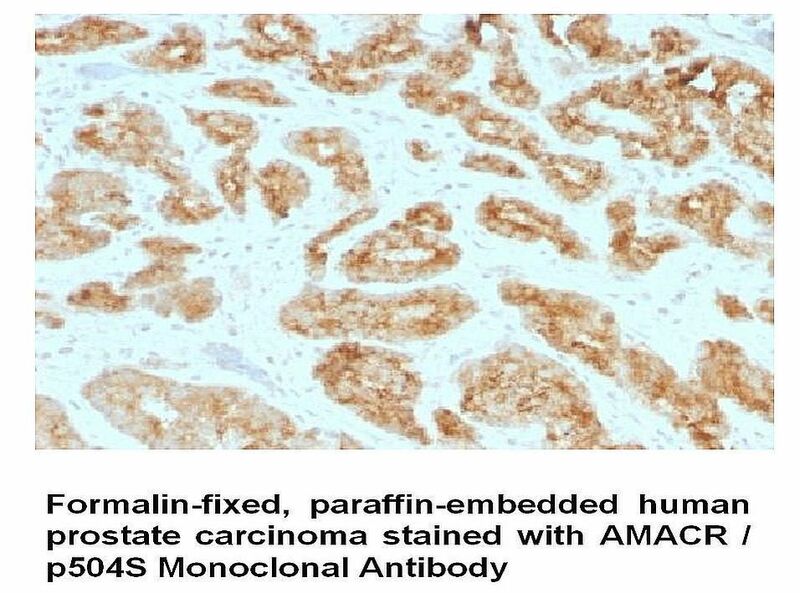 AMACR expression can also be found in hepatocellular carcinoma and kidney carcinoma. Past studies have also shown that AMACR is expressed in various colon carcinomas (well, moderately and poorly differentiated) and over expressed in prostate carcinoma.